​The 1 REP GYM works by registering exactly the amount of “force” you’re able to generate each and every single time you use the gym. The 1 REP GYM has a maximum force capacity of 3,000 pounds. If that's not enough, I'll build you one with a 5,000 pound capacity! Solidly built to last a lifetime – US made, welded construction. Precise -- Positioning of the body produces optimal results! 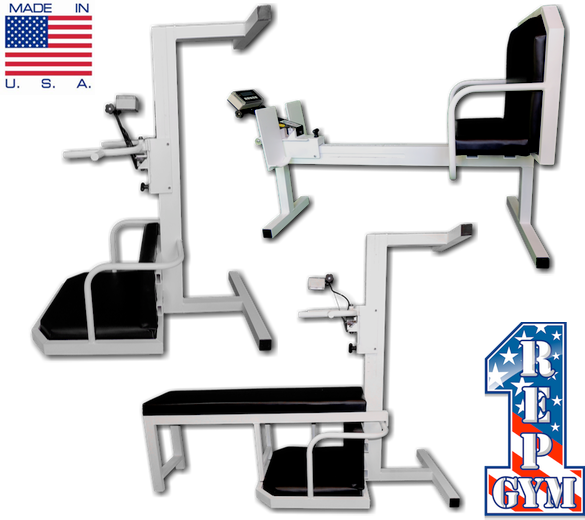 Relocate bar or foot plate position instantly when training. Easy to read LCD Digital Readout display which allows you to track your progress and more importantly inform you when you're under recovered. Simple and easy to use seat belt used for lat pull down and ab exercise. No pulleys, plates, bands to fuss with.